Cleaning my office, aka the laundry room over our garage, recently, I found a batch of photographs from my first trip overseas. A friend from high school had moved to Paris after college and routinely sent me postcards and letters regaling me with his adventures living the life of an expat. Everything sounded so glamorous, and I knew I just had to get my foot in the door so that I, too, could become cosmopolitan and mysterious, just as he had. So I booked myself a trip, took a couple of weeks off from work and arranged with my law school professors to be gone for that time, then hopped on a British Airways flight from Boston to London. After four whirlwind days in London, I hopped on the then-newly opened Eurostar train to cross the English channel to Paris. 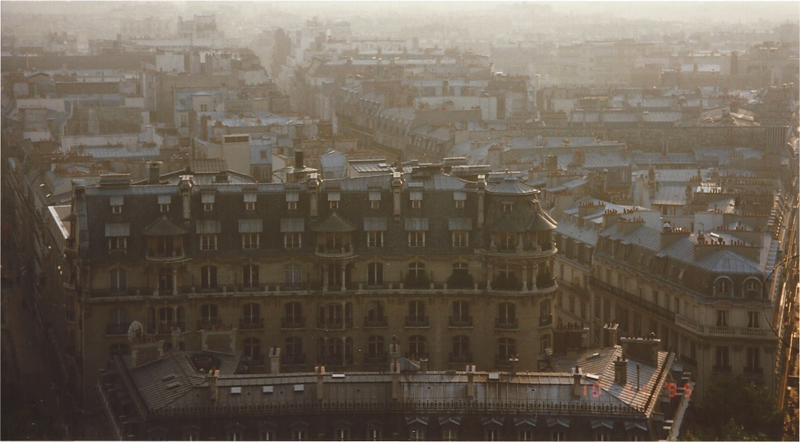 Once in Paris, my base of operations was my friend Chris’ apartment. 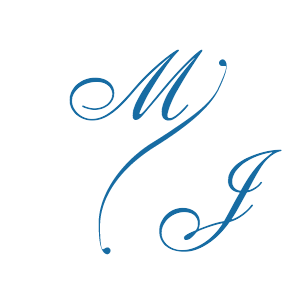 He was working full time, and his evenings were taken up by his latest love interest and their social whirligigs, so except for the one or two evenings we planned to have dinner together and catch up, I was on my own in Paris for ten days. 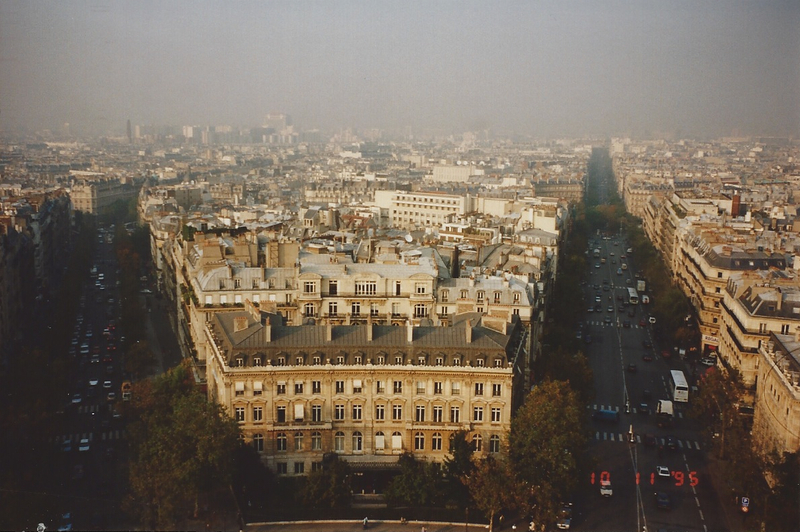 His flat was on a side street just off Boulevard Saint-Germian, near the Maubert-Mutualite metro stop. Chris left me with everything I would need to navigate my way around the city: a walking map with metro stops highlighted that I would need to get to the big monuments, the closest Monoprix and markets circled so that I could get food, and his favorite cafes and dinner spots. We ate lunch together the first afternoon I arrived, and then I set about exploring the city, my constitutional law textbook sitting on his kitchen counter waiting for me to get back in the evening. It remained there throughout my stay. I must have walked for miles carrying the little Mandarina Duck backpack I purchased at a little store on the corner of his street and Saint Germain. I carried that bag for years after I came home until the straps finally just gave out. It was a sad day. The walking shoes I brought with me were worn out and had to be tossed by the time I returned to the U.S. as the footbed was as flat as paper. I wanted to purchase another pair when Ernie Hemingway and I went to Paris on our honeymoon years later, but I couldn’t find them, so I wound up with something else that wasn’t nearly as comfortable. Of course, it could have been revisionist history, the fact that I was fifteen years older, or even that I was six weeks pregnant when Ernie and I went that made the second pair not nearly as wonderful. 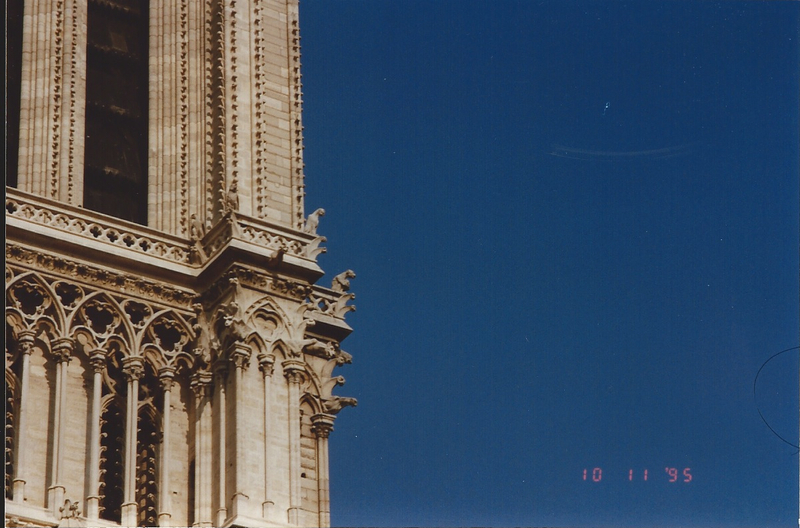 Thumbing through the photos, I was struck anew with the beauty of the architecture. I was fascinated by all things European even as a child, and I remember being so enthralled with Dickens’ and Hugo’s settings that I nearly ached with the desire to see the places where their characters’ lives unfolded. 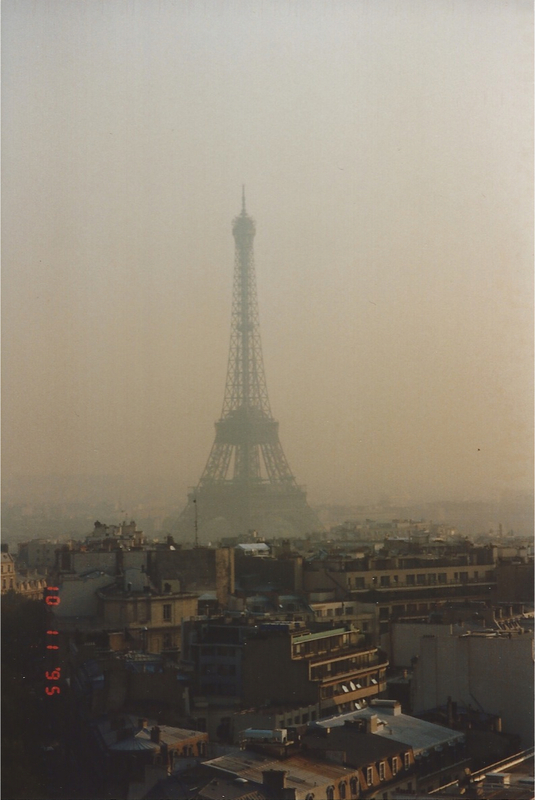 I don’t recall the weather being inclement when I was wandering through the streets, but the photos tell a different story, and it seems that all my photos of La Tour Eiffel are shrouded in cloud cover. 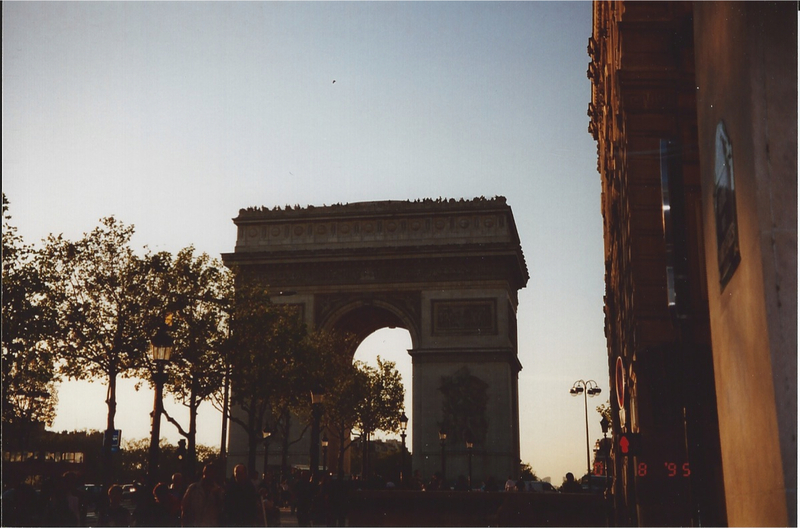 As if the streets of Paris were not enough of a treasure for a young woman just starting her life, the I.M. 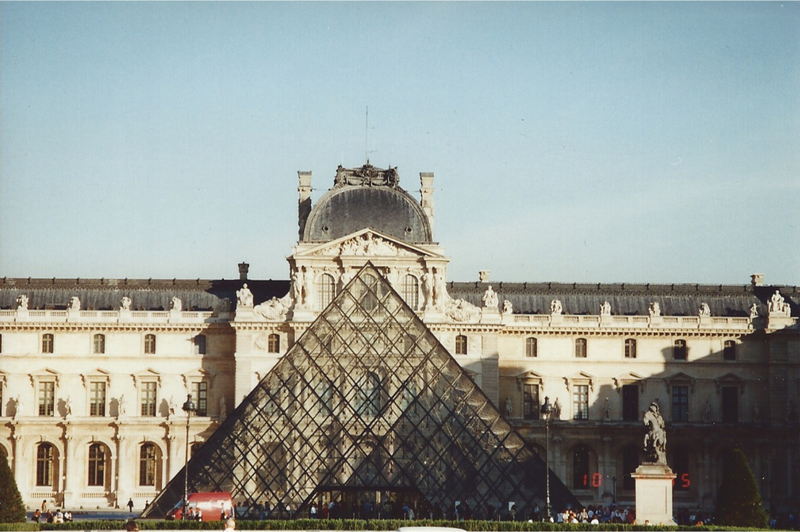 Pei designed Louvre pyramid, the main entrance to the storied museum, beckoned from a distance, teasing me towards the treasures hidden beneath the streets. 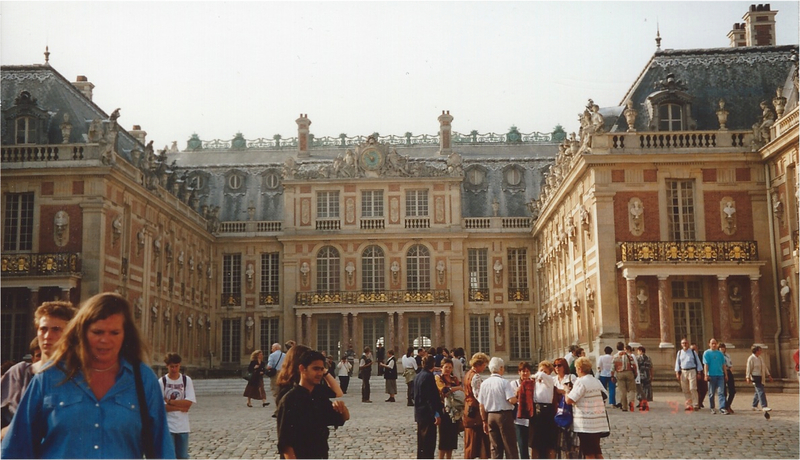 Parisians wandered through the courtyard, accustomed to the majesty of the structure, the significance of the museum and all within just another part of their birthright. 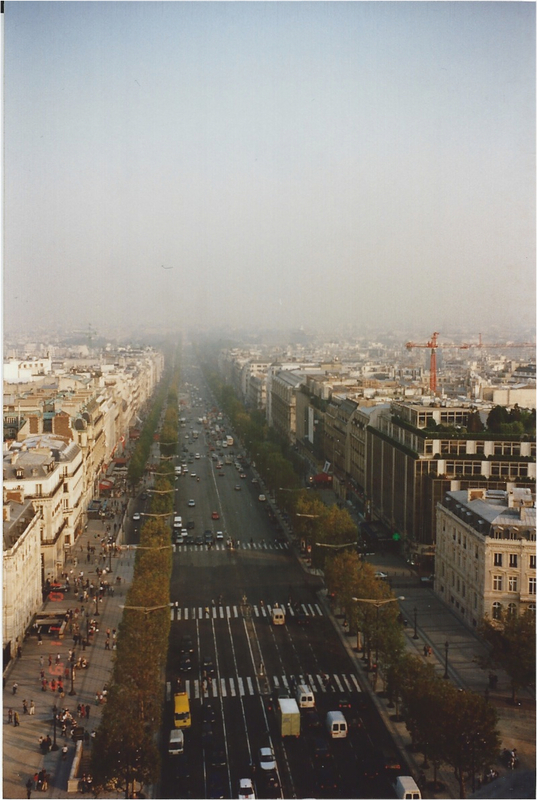 Les Champs-Elysees is filled with traffic of the pedestrian and automobile types, but my eye strays quickly from the pavement to the rooftops lining the street, the windows opening above the city, allowing inhabitants the chance to escape for a moment into the space just between reality and irrationality. 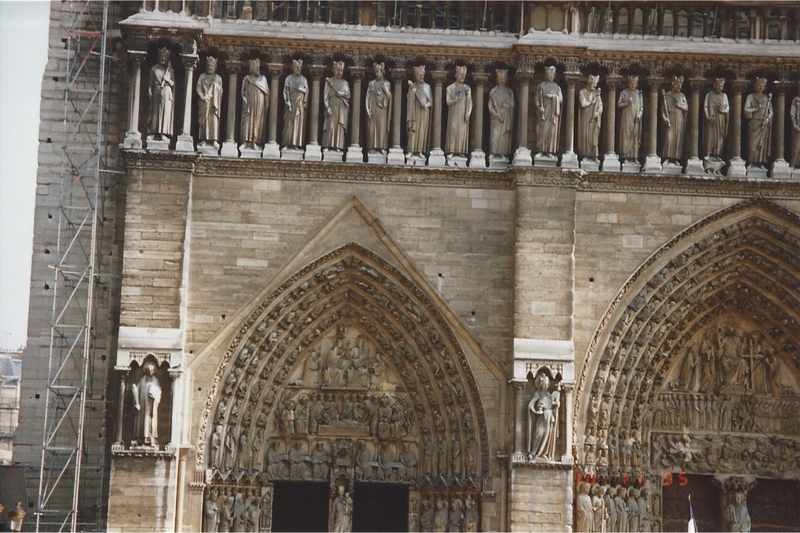 The gargoyles of Cathedrale Notre Dame de Paris fascinated and repelled me. The intricate carved figures that lined the doorways drew me into the dim interior. 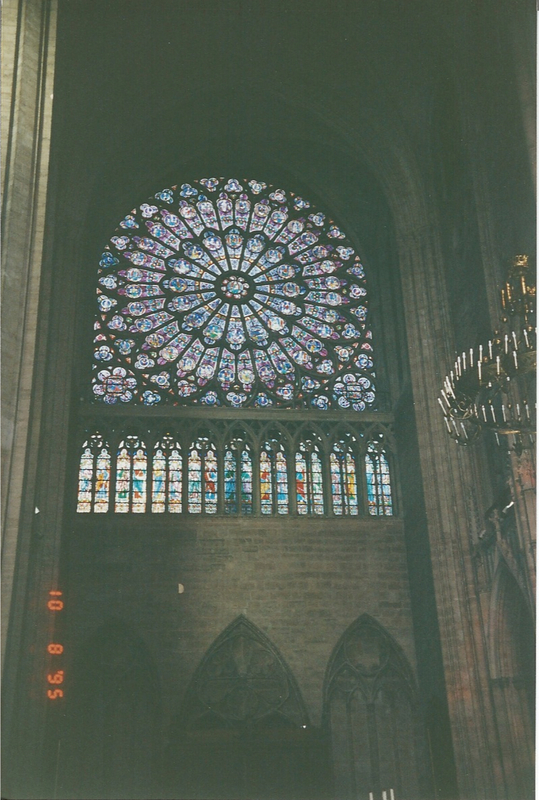 The stained glass windows spoke of centuries past, lives lived and passions frozen in the intricate designs. Never a religious person, I was nevertheless compelled to light a candle for my grandfather, gone more than eight years by then. I stayed the remainder of that day in Il de la Cite, hanging out at a cafe nearby, feeling that somehow to be in the presence of the structure was to be close to my grandfather. He landed on Omaha Beach on June 6, 1944. I knew I would not get to Normandy on this trip, but merely being in France seemed to bring me closer to him. As I wandered home for dinner, I turned and snapped a photo of the sunset over the cathedral. and the smaller, Arc de Triomphe du Carrousel, originally intended as the entrance to Tuileries palace. 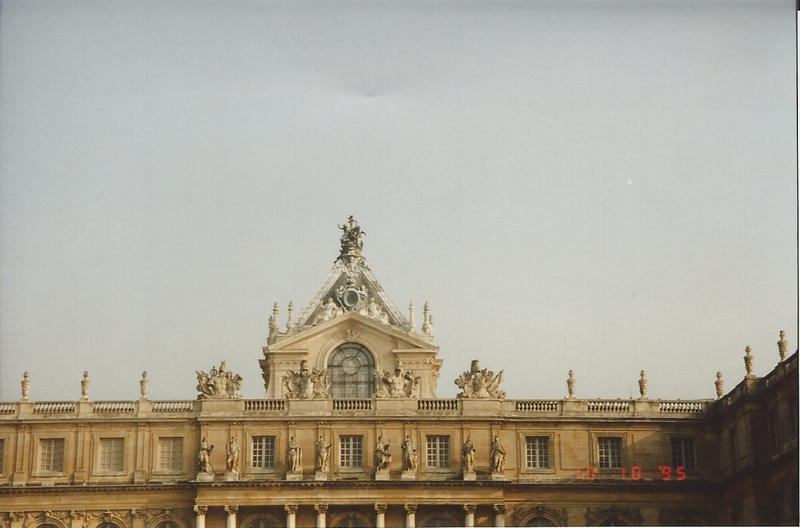 Although I was told riding the RER (the Réseau Express Régional rail system serving Paris and its suburbs) was a daunting prospect even for a French-speaking rookie, I was undeterred and took a ride out to the Chateau de Versailles. I didn’t speak French beyond high school level, but I was not going to miss the opportunity to see the place so synonymous with privilege and opulence. 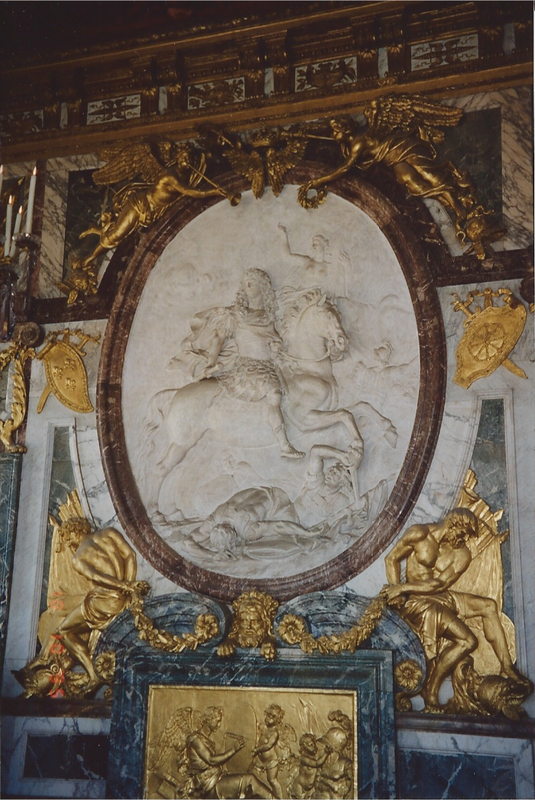 the relief sculptures inside so detailed that they jump off the walls and into your heart. The gardens are expansive and maze-like; even without the full-flowering blossoms and without the fountains running, I was lost in another world, peaceful and contemplative. 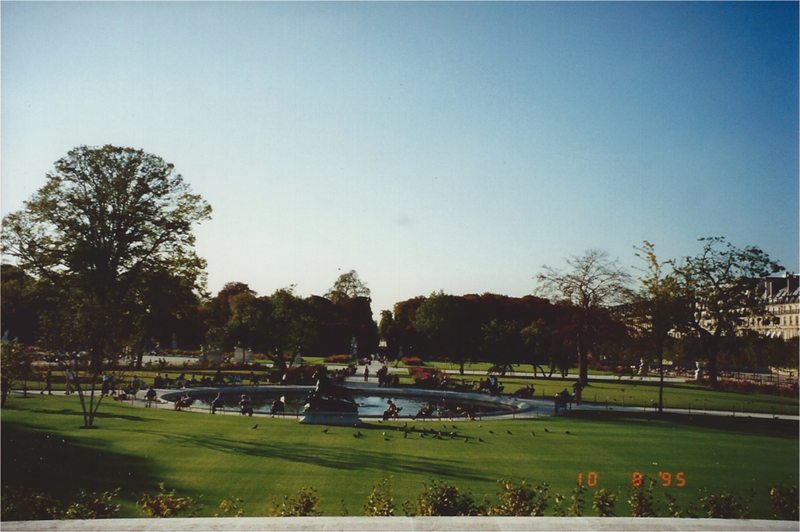 I spent hours wandering through the autumnal gardens of Paris and its suburbs during the two weeks I spent there. I was in my second year of law school and I thought my life should have been settled. I contemplated whether the boy I was dating at the time was the one, or just another one. I wondered at my place in the world just as I was discovering that there were no boundaries to where I could go and what I could accomplish. 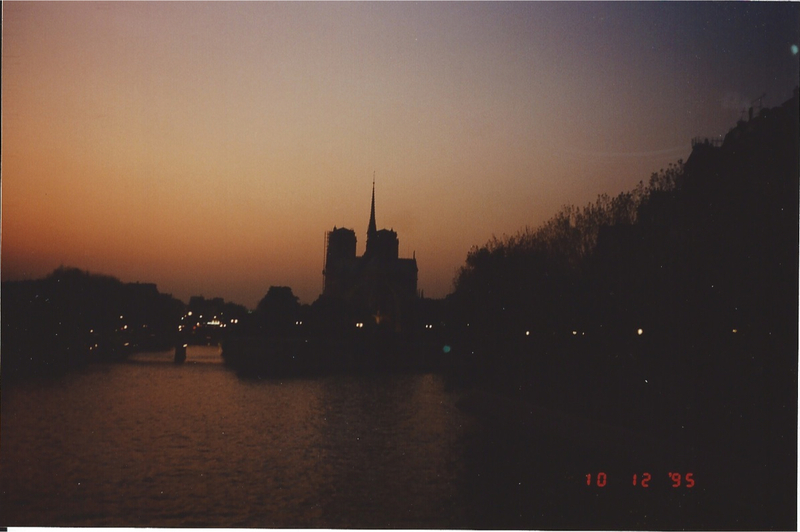 When I think about my first time visiting Paris, I recall a headstrong young woman with the world at her feet wandering around completely unaware of her own power and strength. I marveled at the handsome young Parisian men and their smoldering sexuality, wondering why they would want to talk to me. I felt so awkward and plain in comparison to the sophisticated and beautiful European beauties, in my eyes so reminiscent of a young Sophia Loren, Brigitte Bardot or Catherine Deneuve. What I see now when I look at photos from that time is different. I see a beautiful and adventurous young woman, stronger than she gives herself credit for as she jumps off the high board into the deep waters of life without a thought of danger or doubt that she can handle anything life throws at her. I see a young woman who shook off the mantle of safety her middle-class upbringing brought her so that she could take flight. If I could give that young woman one piece of advice, I would tell her that she had no idea how long her life really would be and she should live every moment just as she lived those two weeks in Paris: out loud and without doubt. I would tell her that she ruled the world. Posted in Just Life, Memory Mining, Travel, Uncategorized. Tagged beauty, experience, feeling good, growing up, happiness, just life, memories, Paris, the little things, youth.